Federer: China needs a male tennis star! LONDON: This was meant to be the year when Roger Federer would equal, if not break, Pete Sampras' record of 14 grand slam titles. Instead, it was a season in which Rafael Nadal finally spread his tentacles beyond Roland Garros. The Spaniard first grabbed Federer's Wimbledon crown, then snatched Olympic gold in Beijing. That failed to satisfy Nadal's hunger and he went on to end Federer's record 237-week reign as world number one just hours after the Olympic medal had been placed around his neck. "Almost a perfect season, no?" quipped the 22-year-old Nadal, who took his grand slam tally to five. While Nadal's rampaging run heralded a new era for the men, the women's game also underwent a changing of the guard - albeit rather unexpectedly. Justine Henin stunned the tennis world when she abruptly abdicated her position on top of the rankings by quitting the sport 11 days before she was expected to defend her French Open title in May. "I have been driving my career based on an emotion but I didn't feel that emotion any more. It's the end of a wonderful adventure," the seven-times grand slam champion said. The 25-year-old Belgian became the first woman to walk away from tennis while ranked number one and her absence sparked a mad scramble for the top spot. In the last six months, the battle for supremacy became so intense that the top spot changed hands six times until Serbia's Jelena Jankovic won the final round of musical chairs to clinch the coveted year-end prize. For much of the season though, prizes were in short supply for Federer. He had high hopes of erasing Sampras' name from the record books in 2008 as he started the year as the owner of 12 grand slam trophies and as the defending Australian Open, Wimbledon and US Open champion. That dream effectively died less than four weeks into the New Year when, suffering from a bout of glandular fever, the Swiss relinquished his Melbourne Park title with a semifinal defeat to eventual winner Novak Djokovic. After failing to reach a slam final for the first time since the 2005 French Open, Federer acknowledged: "I've created a monster. It's not easy coming out every week trying to win." Federer was vanquished in the Roland Garros and Wimbledon finals - on both occasions by his personal bogeyman. The irrepressible Nadal enhanced his reputation as arguably the greatest claycourt player when he swept aside Federer with embarrassing ease, dropping only four games, in the French Open final to lift his fourth successive title in Paris. Four weeks later, Nadal punched a mighty hole through Federer's aura of invincibility to end the Swiss man's five-year reign as Wimbledon champion. In the longest and most nerve-jangling final seen at the All England Club, Nadal survived two rain breaks and an astonishing Federer fightback to claim a sensational 6-4 6-4 6-7 6-7 9-7 victory as dusk fell over southwest London. 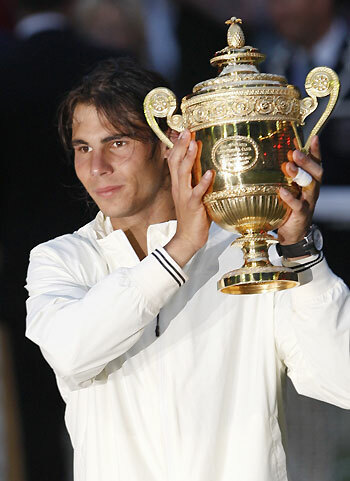 While Nadal became the first man since Bjorn Borg in 1980 to complete the Roland Garros-Wimbledon double in the same year, Federer lost his chance of eclipsing the Swede and setting a modern-era record of six successive Wimbledon titles. Being part of a match described by pundits as the greatest ever seen provided little consolation to the stylish Swiss. "It's tough, it hurts. This is a disaster, Paris was nothing in comparison," said a forlorn Federer. Nadal and Federer had met 17 times before but none of their previous encounters could match the drama and intensity of the four-hour-48-minute theater witnessed by almost 15,000 fans lucky enough to hold Centre Court tickets. "Unbelievable match! It was an amazing spectacle! It was the greatest match I have ever witnessed. It had so much drama," said former champion John McEnroe. "This day (is one) that we're not going to forget. This was a win for tennis and I'd like to think there were no losers." Despite reaching a semifinal and two finals in the season's first three majors, Federer was irked to see that critics had started to pen his tennis obituary after he was beaten by players such as Mardy Fish, Radek Stepanek and Gilles Simon. Andy Roddick was among those rivals who rallied behind him. "I know pretty much every player except for one that would take his bad year. So I think you have to use a little bit of perspective," said the American. Those ready to write him off would have done well to study the obstacles a resilient Federer had overcome. Despite suffering from the debilitating effects of glandular fever, he still managed to turn up at every event he had committed himself to. The same illness had kept Croatia's Mario Ancic off the tennis courts for six months in 2007. Just when it seemed that Federer would walk away from the majors empty-handed, he reminded the world of his sublime touch and impeccable timing to capture an Olympic doubles gold and a fifth successive US Open. The Flushing Meadows showpiece also set the stage for an enthralling 2009 as Britain's Andy Murray finally came of age to reach his first notable final. The exploits of Serbia's Djokovic, who trails Federer by just 10 points in the rankings, and Murray indicated that the Federer-Nadal duopoly in men's tennis had at last been broken. The women's game is likely to remain more unpredictable since each of the four slams produced a different winner - Maria Sharapova, Ana Ivanovic, Venus and Serena Williams claiming the honors at the Big Four. A knee injury kept Nadal out of the Davis Cup final in November but his lesser-known compatriots pulled off a shock 3-1 win away to Argentina. Russia, led by Svetlana Kuznetsova, won the Fed Cup for the fourth time in five seasons with a whitewash of Spain.